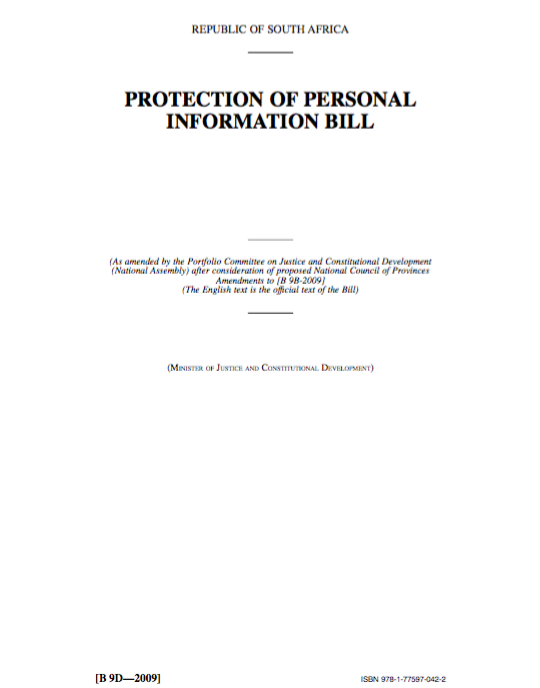 Are you looking to download the latest version of the Protection of Personal Information Bill? You actually need to look at the Protection of Personal Information Act because the Bill has been enacted and is now an Act. A bill is a draft law, whilst an Act is a law enacted by Parliament. The Protection of Personal Information Bill is essentially an old version of the law and will no longer be of any assistance to you. You need to be focused on the POPI Act (not the Bill) and how you are going to comply with it. It was a long process and there were many different versions of the Protection of Personal Information Bill. They are all now irrelevant because the law has been enacted in the form of the POPI Act. The latest and last version of the Bill was the Protection of Personal Information Bill B9D-2009. The Protection of Personal Information Bill had one of the longest stays in Parliament. With all the drafts and re-drafts it took more than a decade before the final version was passed. The Protection of Personal Information Act was enacted in November 2013. Find out more about the POPI Act and how to comply with POPI yourself by attending a POPI Workshop. Get specialist subject matter expert support to empower you to implement POPI by joining the Michalsons POPI Compliance Programme. Comply with POPI by getting Michalsons to do some action items for you.